The H Wireless fires a shot across the bow of the Astro Gaming A50. The SteelSeries H Wireless is expensive, but whatever sadness it induces in your wallet is more than compensated for by the wireless gaming glee it delivers to your ears. 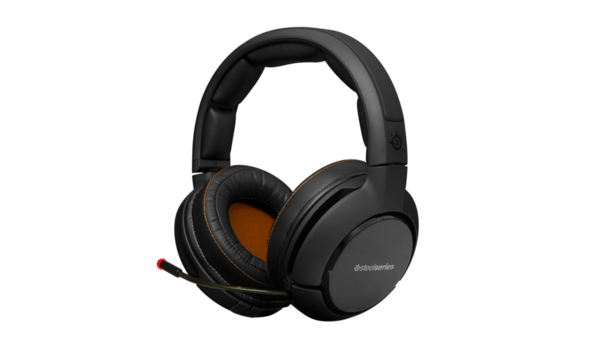 The SteelSeries H Wireless fires a shot directly across the bow of the similarly priced and featured A50 wireless headset by Astro Gaming. NOTE: You can find a free “hidden” code for Hi-Rez Studios MOBA Smite to unlock NEMESIS in this post. The Wireless H transmitter and control unit is a sharp-looking box about 4.25”x 4.25” x 1.5” tall. On the back are the power, Optical In/Out, USB, 3.5mm input, and Chat output connectors. On the front is a nice, high-contrast OLED display, a single button, and a large volume knob that also doubles as a button. Just configure the AC adapter with the appropriate plug for your part of the world (SteelSeries includes a complete selection), plug it in to the transmitter, and then connect the transmitter to your PC. PC gamers will generally use the USB connector to connect to the PC, or the Optical connectors depending on the setup. The SteelSeries H Wireless delivers above-average comfort. Thick memory foam wrapped in faux leather lines the ear cups and the headband, which fits snugly to help eliminate external distractions. Similar to the equally (if not more) snug Turtle Beach XP Seven, the H Wireless can get a bit uncomfortable after extended wear if you don’t have a lot of ‘natural’ cushioning (i.e. hair). The H Wireless is elegantly and thoughtfully designed. The controls are simple, generally well-designed, and provide a lot of features. The microphone, similar to many SteelSeries headsets, is highly flexible and extends from the left ear cup. The tip lights when it’s muted. The power button on the headset is located on the underside of the right ear cup. Tap the power button to mute the microphone, or hold it (long press) to power off the headset. A small volume roller just behind the top of the right ear cup also controls the transmitter—it effectively doubles as the large volume control knob/button on the transmitter, so you can change equalizer settings, audio sources, and other options without getting off the couch. Overall the general design of the H Wireless is very good and well-engineered. I would have liked a larger volume roller on the headset, and I still (in general) prefer large, easy-to-find buttons on the outer ear cups, similar to the design for the Logitech G930 wireless. Regardless, the SteelSeries H Wireless is still among the best overall wireless headset designs (which also includes its transmitter/control module) that I’ve had the pleasure to use, and provides more options and features than a similar (and excellent) competitor, the Astro Gaming A50. Where the H Wireless really shines is in its multi-function control module, which makes a nice addition to a PC gaming desktop and puts a lot of useful options within easy reach. Thanks to the high-contrast to display and intuitive controls, it’s also easy to change settings in the dark. Push the large knob to access the control module’s menus, navigate, and access/modify your chat, game, and equalizer audio settings. Better still, if you don’t want to get off the couch, you can do the same thing by clicking the volume roller on the headset. In addition to its primary functions—changing volume, switching audio sources, or changing equalizer settings, the control module acts as a battery charger for the secondary battery included with the H Wireless. Slide the battery in to charge and it’s out of the way. In addition, the display shows the level of charge in the headset’s battery. If you need to change the battery, just open the left ear-cup with a simple twist, swap the batteries, and you’re good to go. The batteries are rated to last roughly 20 hours. Changing batteries is easy and I commend SteelSeries for including 2 of them, but I would still like the option to plug the headset into a USB cable. Perceptions of audio quality are 100% fully subjective, so let me start with this: I didn’t find anything I didn’t like. I didn’t detect distortion or ‘muddy’ audio cranking up music and movies to high volume levels. The H Wireless delivers solid, thumpy bass. For surround sound, I prefer to use Valve’s Left 4 Dead 2 as a test bed because it makes some of the best (and most functional) use of 5.1 and 7.1 surround sound. It’s always a given that headset surround sound is never as good as ‘the real thing’ i.e. 7.1 speaker set up. Typically the side and surround channels are difficult to differentiate. That said, in a side-by-side comparison between the Astro Gaming A50 and the SteelSeries H Wireless, I’d give a slight (subjective) edge in overall audio quality to the A50, particularly with regard to music. The A50 delivers slightly richer, more immersive bass and seemed ever so slightly clearer—but again, let your ears be the judge. But on whole, the SteelSeries H Wireless delivers good-to-excellent audio quality on all fronts, and a good surround sound gaming experience. The H Wireless is an excellent wireless headset that is feature-rich and thoughtfully designed. It’s certainly worth comparing to the likes of the similarly priced Astro Gaming A50; the SteelSeries H Wireless provides a slightly superior feature set and more options, but I’d tend to give the A50 the edge in overall sound quality and comfort. Previous Post: The Asus RT-AC68U AC1900: My wireless savior. Probably.